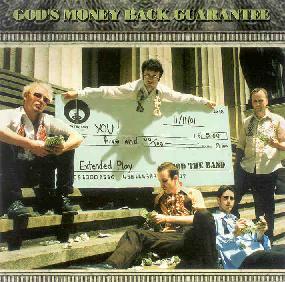 GOD The Band - "GOD's Money Back Guarantee"
The latest from New York rockers GOD is a 4 song EP that the band mostly released for promotional purposes (read Chuck's review of an earlier release in AI #15). The disc opens with a rocking cover of Jefferson Airplane's "White Rabbit". It's pretty wild alternating between a quirky metallic style and freaky New Wavey keyboards. "The Lifter" is a wild blend of early Mothers Of Invention Doo-Wop and Greek folk band. The song is whimsical and fun and includes some impressive vocal harmonies. "Candidate" is a rousing rocker with cool embellishing guitar bits that have a strange wild slide effect. The band get fairly frenzied on this one. And finally, "(You Will Be) So Much Better Without Her" starts off as a cryin-by-the-jukebox country tune, but soon takes on a heavy soul feel. Hallelujah! In summary, GOD are a tight ensemble of excellent musicians with a welcome twisted sense of humor. Kind of like a harder rocking pop music version of Zappa. Interesting stuff. For more information you can visit the GOD web site at: http://godtheband.com. Contact via snail mail c/o GOD-The Band; 780 Madison Ave #3A; New York, NY 10021.